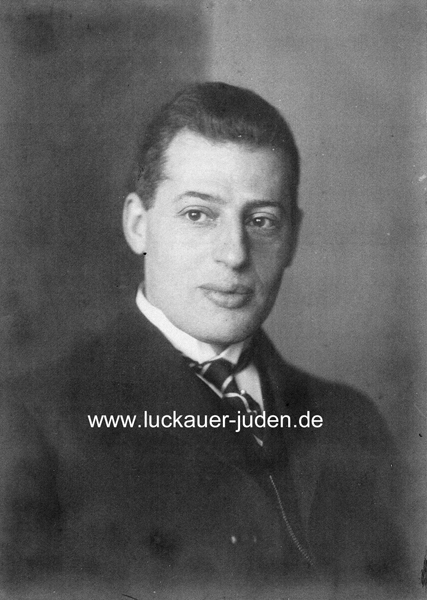 Zu Beginn der Recherchen, es gab bereits Gewissheit das der Luckauer Zweig der Familie Simke augelöscht war, fand ich auf der Suchseite von Yad Vashem einen Hinweis. Es gibt ein Testimony in welchem zu erkennen ist, dass auch in Lübben ein Zweig der Simkes ansässig war. Durch die Personalien war es mir möglich mit dem Verfasser Kontakt aufzunehmen. Dies ist nun 10 Jahre her. 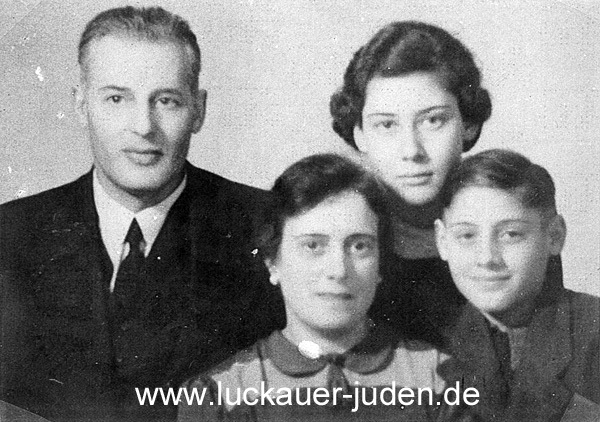 Charles Leigh geboren als Karlheinz Liebenau hat überlebt, weil er 1939 mit seiner Schwester auf Kindertransport ging. Er ist jetzt im 92. Lebensjahr und hat die folgenden Erinnerungen dieses Jahr verfasst. Weiterführende Unterlagen und Zeugnisse befinden sich u.a. im Jüdischen Museum Berlin. Die Familie Simke stammt ursprünglich aus Grätz im Regierungsbezirk Posen. Bertha und Simon Simke hatten mindestens 7 Kinder, die in Grätz geboren wurden. Kauffmann Simke heiratete Rachel Damitt und zog nach Cottbus. Moritz Simke heiratete Emilie geb. Kaul und lebte in Posen. Tochter Ernestine heiratete in Grätz und verstarb auch dort. 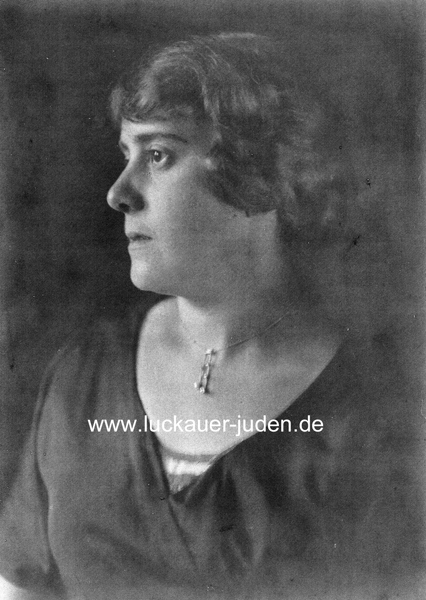 Chaskel Simke heiratete Johanna Drucker aus Birnbaum und siedelte sich in Luckau an. Karoline Simke heiratete den Kaufmann Hermann Moses aus Lübben. Ihre Mutter Bertha zog nach dem Tod ihres Mannes auch nach Lübben. Karl Simke heiratet Helene Badt und wohnt seit mind. 1888 in Berlin. Leopold Simke heiratet Malwine Jablonsky aus Lübben und stirbt 1901 in Berlin. Außer der Familie von Karoline Moses in Lübben verlassen die Geschwister ihre Wirkungsstätten und ziehen Ende des 19. Jh. nach Berlin. Die Posener Simkes wohl Anfang des 20. Jahrhundert. Während Caskel im Osten von Berlin wohnt, wohnen seine Geschwister in Charlottenburg. Ihre Kinder heiraten, bekommen selber Kinder, werden aber nicht mehr erleben, wie sie ihr Leben meistern werden. Denn fast alle fallen dem Nationalsozialismus zum Opfer. Sie werden erschossen, vergast oder verhungern in den Ghettos. Unter Einfluss der kollektiven Trauer um den Jahrestag einer verstorbenen britischen Prinzessin, hat Charles Leigh seine Gedanken zum Ausdruck gebracht. 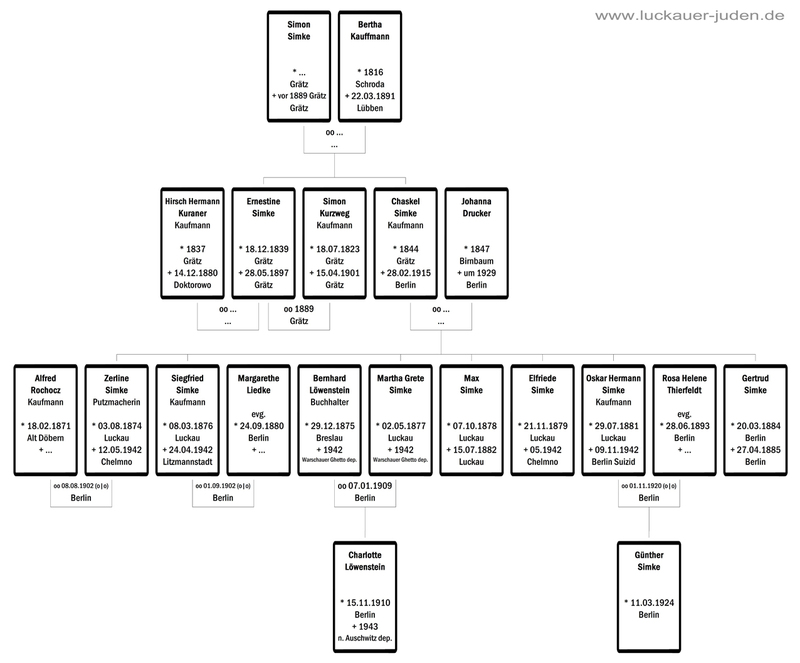 HOW, AND WHY MY DEAR PARENTS DIED. 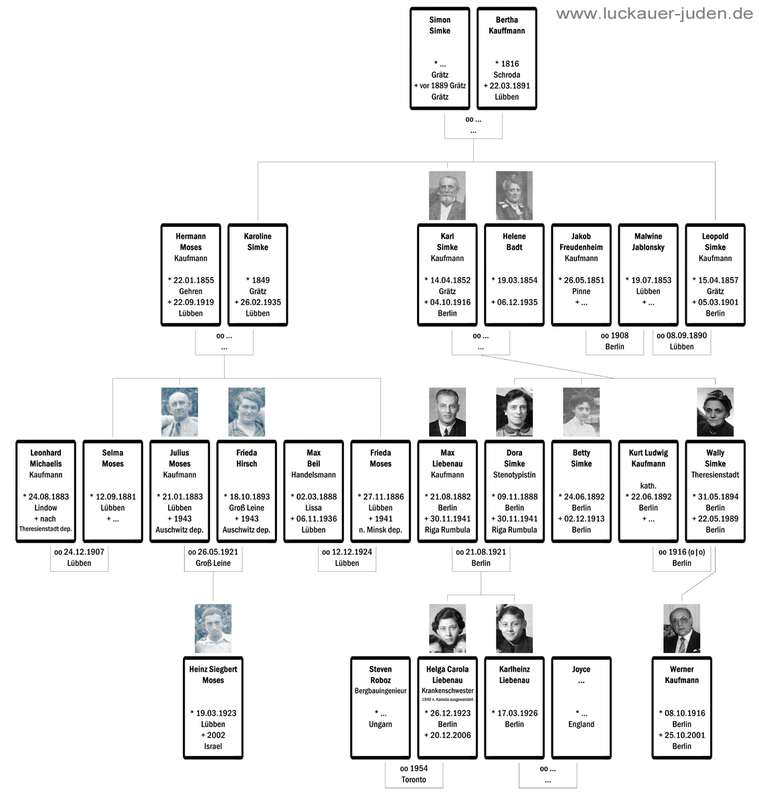 My parents, Max Liebenau and Dora Liebenau nee Simke married on the 21. August 1921. During the First World War my father had served four jears on the Western Front in the German Army as a first aider and stretcher bearer. Both my parents belonged to the Jewish religion, my father being a stronger believer than my mother. They were well educated, my father working as a representative for a large firm that dealt in textiles. My mother was employed as a stenographer. When my maternal grandmother retired from her small haberdashery shop, my parents took over the business. On the 23. December 1923 my sister Helga, Carola was born, and I followed on the 17. March 1926. I was given the name Karlheinz, both my sister and I having been named after my grandfather Carl Simke. We lived in a comfortable apartment in the Berlin district of Charlottenburg, facing the street from the first floor. My sister und I enjoyed a happy childhood, and we went to the same elementary school in the Sybelstraße. Boys and girls were taught in different parts of the building. When Adolf Hitler came to power in 1933, the whole world for us Jews was turned upside down. Our parents had to give up their shop a few years later, and the non-Jewish pupils at school no longer spoke to us. We suddenly became different people, and we were completely isolated from everything. Those who taught at universities, or held other higher positions in life, lost their jobs. In time Jewish children were no longer allowed to attend the schools they were in, and had to be taught in Jewish schools. Some blocks of apartments were hastily converted into classrooms, and my sister and I managed to get a placing in the Klopstock Straße in the district of Tiergarten. My father was more out of work than in, and we finally had to move into a cheaper apartment in the Niebuhrstraße at the rear on the fourth floor. All Jews were slowly reduced to third-class citizens, a citizenship that we were stripped of in 1935, making us stateless. It was my mother’s 50th. birthday on the 9. November 1938, and in the night from the 9. to 10. November most of our synagogues were torched, and Jewish shops were smashed up and looted. Many Jewish men were arrested and taken to concentration-camps in Dachau und Buchenwald. The pogrom became known as “The night of broken glass” (Kristallnacht). Jews were no longer allowed to visit certain cinemas or theatres. Barred from all restaurants, and park benches were painted in blue and yellow. The yellow ones for Jews only. A few Jewish shops were kept open where Jews could purchase the goods that required. All the non-Jewish shops were barred to Jews. In March 1939 we had to queue for hours in the cold to be issued with identity-cards. They were made from a thin linen material, with a large “J” for Jew on the front, with our fingerprints inside, and they had to be signed with a middle name, Israel for males, and Sara for females, and the biggest insult was to make us pay a certain amount of money for the privilege. I was able to celebrate my Bar Mitzvah in one of the three remaining synagogues. They couldn’t torch those, because they were built next to other blocks of flats. My sister and I were fortunate in finding places on what became known as a Kindertransport to England, and to have someone to guarantee for us. We left Berlin on the 03. May 1939, after having our photographs taken on the previous day. In between jobs my father managed to learn the baking trade, and his first job was with a Jewish baker by the name of Grienbaum. Friends of ours told my father that with his new skills that there shouldn’t be any problems for my father to find work in England. 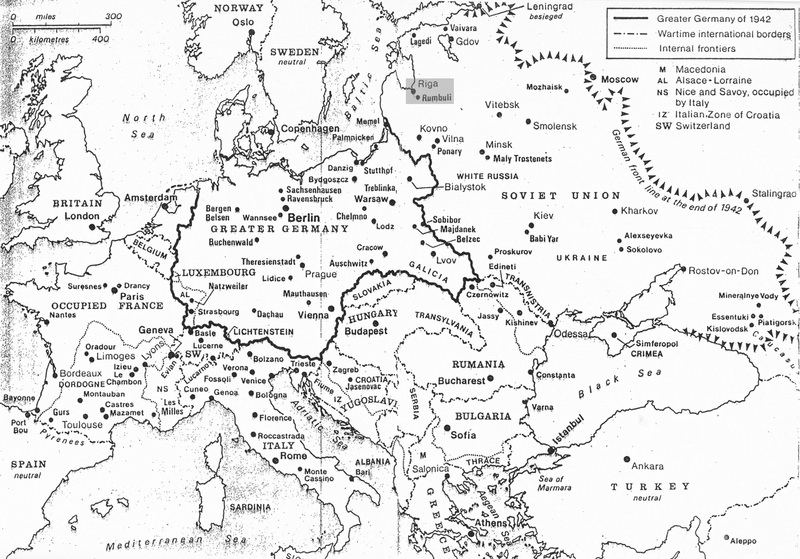 The only trouble was, that the borders of most countries were closed to Jews wanting to leave Germany. Jews in general were slowly worn down by persecution and restrictions. Deprived of their livelihoods, having been forced to hand in their valuables, and finishing in poverty. A lot of praying went on for deliverance from the evil that befell us, but people in other countries just shut their eyes and ears. My sister and I received 74 letters and cards, including Red Cross cards, that I translated into English many years later. “Letters from a terrible past, 1939/41” When the Second World War started, my parents sent their mail via a relative in Amsterdamm, and when the Netherlands were overrun by the Germanns, mail came via family in the U:S:A. We received the last post from our parents some time in October 1941. Our parents’ letters were full of love and advice, but they never contained words of despair or hopelessness about their own situation. My father managed to find work with a non-Jewish baker who asked my father to leave again after a short while. “What would his customers say if they found out that he was employing a Jew?” On the 27. November 1941 my parents were taken to the Grunewald Station in Berlin, and together with 1.050 other Jewish people, that included whole families, put into cattle-trucks, and I assume that there was standing room only. There were no windows to let in light or fresh air. No food or water, or toilet facilities. The torturous journey lasted three days and nights. I imagine that when the doors of the trucks opened, the ice-cold air from the outside, and the stench from the inside of the trucks must have been overwhelming. The train had stopped just outside Riga in Latvia, and in the 30. November 1941 everyone was herded into the Rumbuli Forest and shot. The end had come after having to endure nearly eight years of persecution, being deprived of their German citizenship, forced into poverty, and being despised and degraded in every way. My parents had lived in fear from day to day, not knowing what the next day would bring. My parents had been decent, honest, and caring people, who didn’t wish anyone any harm. My sister and I couldn’t mourn the death of our parents, because we didn’t know what had happened to them. It meant two and a half years of uncertainty, but we had hoped that our parents had been spared. The first official report about the fate of our parents came frome the Red Cross when I was stationed with the British Army in Berlin (1946/48). APPENDIX The mass-graves in the Forest of Rumbuli didn’t make any headlines around the world, a world at war. I must admit that the atrocities in Rumbuli, some of many in the various countries in Europe, coulds’t have had any meaning to most people, if not all people. But I would like to make notes of the following. As far as I know, what happened in the forest of Rumbuli has not been mentioned in the press or any other media. I am now in my 92nd. Year, and I am hoping that somehow the people of the world will get to know about the Forest in Rumbuli, if only to acknowledge what all those poor people had to suffer. There weren’t thousands of people laying flowers onto the mass-graves, or lighting candles. There weren’t any protests. No gun-salutes or bugle calls. All together the Germans managed to murder six million Jews in as many years, a third of the worlds’ Jewish population. One and a half million of those murdered were children. Ten million Germans were members of the Nazi Party, and many more millions were sympathisers of the regime. They were all directly or indirectly responsible for the mass-murder of Jews. The Germans who lived before and during the Second World War shold have been ashamed of themselves. The Germans who gave the world Beethoven and Schiller should have alarm bells ringing, and not follow a man who was mentally deranged and a sadist. In the end the majority of Germans delighted in getting rid of the Jews, and commited the most hideous crime in human history. My parents lie in a mass-grave, and are not remembered by those who should have helped them to survive. My parents had no weapons to defend themselves with, and very few people offered their help, putting their own lives at risk. The majority of the people in the world just stood by to see us suffer. There are many places in Europe where Jews have been butchered by the Germans, but one never hears or reads reports about them. Jews never beheaded anyone, or flown passenger planes full of people into skyscrapers, or driven lorries into crowds of people. Michael Portillo, who presents the programme, “Railway Journeys in Europe” on television, visited Riga in Latvia in one of his shows. A lovely looking city, with coffehouses, and cheerful looking inhabitants. At no time was there a mention of the Forest in Rumbuli, and its massgraves. Is there anyone living in Riga aware of the graves in the forest? In compiling this small booklet, I am hoping that all those who are buried in mass-graves all over Europe will at last be thought about, and not as forgotten as they are now. WIE UND WIESO MEINE LIEBEN ELTERN GESTORBEN SIND. Meine Eltern, Max Liebenau und Dora Liebenau geb. Simke haben am 21. August 1921 geheiratet. 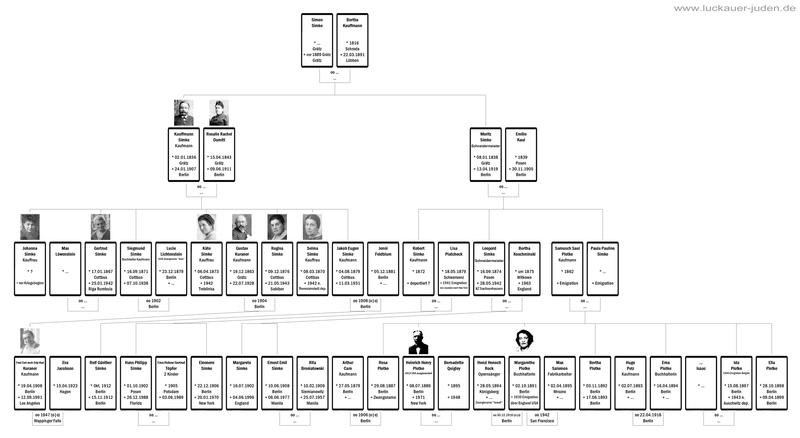 Im ersten Weltkrieg diente mein Vater vier Jahre lang an der western Front in der Deutschen Armee als Krankenträger. Beide meiner Eltern gehörten der jüdischen Religion an. Mein Vater war mehr gläubiger als meine Mutter. Sie waren gebildet, und mein Vater war ein Vertreter für eine grosse Firma die in Textilien handelte. Meine Mutter war als Stenographin angestellt. Meine Großmutter auf Muttersseite hatte ein kleines Geschäft für Kurzwaren. Dieses Geschäft übernahmen meine Eltern später. Am 26. Dezember 1923 wurde meine Schwester Helga, Carola geboren, und ich folgte am 17. März 1926. Mir wurde der Name Karlheinz gegeben nach meinem mütterlichen Grossvater Carl Simke. Meine Schwester und ich verbrachten eine schöne Kindheit, und wir gingen in die selbe Volksschule in der Sybelstrasse. Wie Adolf Hitler in 1933 zur Regierung kam, änderte sich alles für uns Juden. Meine Eltern mussten nach kurzer Zeit ihr Geschäft aufgeben, und die nicht-jüdischen Schüler sprachen mit uns nicht mehr. Wir wurden auf einmal andere Menschen, und wir waren von allem getrennt. 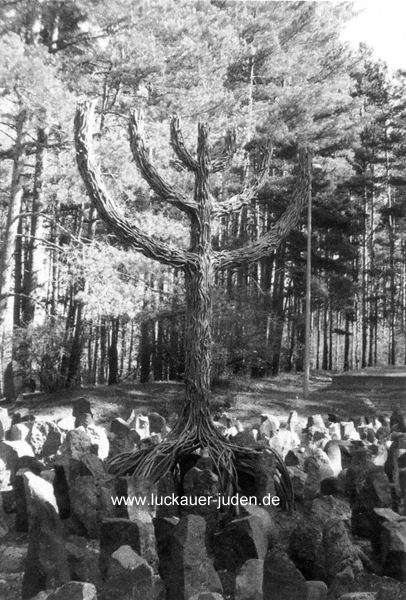 Jüdische Lehrer, und die welche höhere Stellungen hatten, durften nicht mehr weiter dienen. Jüdische Kinder durften nur in jüdischen Schulen gelehrt werden. Einige Wohnhäuser wurden in Schnelle für Klassen umgebaut, und meine Schwester und ich fanden Plätze in der Klopstock Straße, im Bezirk Tiergarten. Mein Vater war vielmals arbeitslos, und mussten wir in eine Wohnung ziehen die billiger war. Die Wohnung war in der Niebuhrstrasse hinten auf der vierten Treppe. Alle Juden wurden Staatsbürger dritter Klasse, eine Bürgerschaft die uns in 1935 entnommen wurde, und wurden wir staatenlos. Es war der 50. Geburtstag meiner Mutter am 9. November 1938. In der Nacht vom 9. bis 10. November wurden die meissten von unseren Synagogen abgebrannt, jüdische Geschäfte zerstört und geplündert. Viele jüdischen Männer wurden verhaftet und in Konzentrationslager wie Buchenwald und Dachau eingesperrt. Der Pogrom bekam für immer "Kristallnacht". Juden durften nicht mehr die Kinos und Theater besuchen, oder Restaurants. Die Parkbänke wurden mit gelber und blauer Farbe gestrichen. Die gelben für Juden. Einige jüdische Geschäfte blieben offen wo Juden ihre Lebensmittel u.s.w. kaufen konnten. Juden durften nicht in nicht-jüdischen Läden kaufen. Im März 1939 mussten wir uns in einer Schlange Stunden lang in der Kälte stehen müssen für Kennkarten, die aus dünnen Leinenmaterial bestanden, mit einem grossen "J" für Jude auf der vorderen Seite, mit unseren Fingerabdrücken, und unterzeichnen mussten wir mit einem Mittennahmen, Israel für männlich, und Sara für weiblich. Die grösste Beleidigung war, man musste für das Privileg eine Summe Geld bezahlen. Ich konnte meine Bar Mitzvah noch in einer der unbeschädigten Synagogen feiern. Drei von unseren Synagogen konnten sie nicht zerstören weil sie in der Mitte von anderen Wohnhäuser standen. 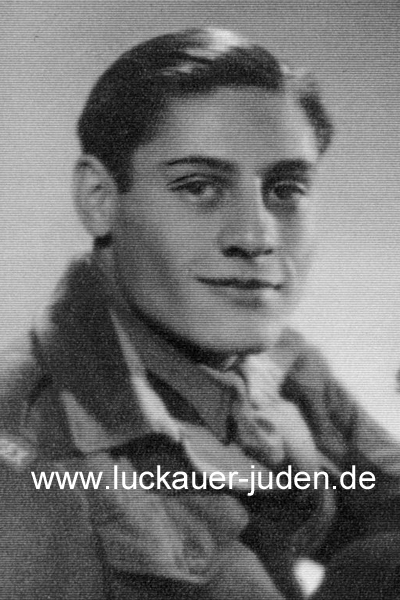 Meine Schwester und ich hatten das Glück Plätze auf einem Kindertransport nach England zu finden, wo wir jemand hatten die für uns grantiert hatten. Nachdem wir am vorigen Tag uns fotographieren liessen, begannen wir unsere Reise nach England am 3. Mai 1939. Zwischen Arbeitsstellen lernte mein Vater das Backen, und seine erste Anstellung war mit einem jüdischen Bäcker namens Grienbaum. Freunde meiner Eltern sagten meinem Vater, dass er mit seinem Handwerk kein Problem haben sollte in England Arbeit zu finden. Nur die einzige Schwierigkeit bestand, dass die meisten Länder ihre Grenzen geschlossen hatten für Juden die Deutschland verlassen wollten. Im Allgemeinen waren die Juden erschöpft von der Verfolgung Einschränkung ihres Lebens. Depriviert von ihrem Lebensunterhalt, und Abgabe ihrer Wertstücke, und letztens in die Armut gezwungen. Viel wurde gebetet für Erlösung von dem Übel welches uns betroffen hatte. Menschen in anderen Ländern schliessen ihre Augen und Ohren. Meine Schwester und ich bekamen 74 Briefe und Karten von unseren Eltern, inklusive Karten vom Roten Kreuz. Briefe die ich auf die englische Sprache übersetzte viele Jahre später. "Letters from a terrible past 1939/41". Wie der zweite Weltkrieg anfing, schickten meine Eltern die Post über eine Verwandte in Amsterdam. Nachdem die Niederlande von den Deutschen überwältigt wurde, ging die Post über die U.S.A. wo Familie von uns wohnten. Die letzte Post von unseren Eltern erreichte uns im Oktober 1941. Die Briefe von unseren Eltern waren voller Liebe und Rat, aber sie schrieben nie von ihren eigenen Sorgen, ihrer Verzweiflung, oder Hoffnungslosigkeit. Ein nicht-jüdischer Bäcker gab meinem Vater Arbeit, aber nach einer kurzen Weile musste mein Vater die Arbeit wieder aufgeben denn "was würden seine Kunden sagen wenn sie wüssten er hat einen Juden angestellt". Am 27. November 1941 wurden meine Eltern von ihrer Wohnung abgeholt, und zum Bahnhof Grunewald gefahren. Mit 1.050 anderen Juden, darunter ganze Familien, in einer der Viehwagons eingesperrt. Ich nehme an es gab nur Standraum. Keine Fenster die das Licht oder die frische Luft einliessen. Ohne Essen oder Trinkwasser, und keine Toiletten. Die furchtbare Reise die drei Tage und Nächte dauerte, endete am 30. November 1941 ausserhalb Riga in Lettland. Ich denke mir, wie die Türen geöffnet wurden, dass die eiskalte Luft von ausserhalb, und dem Gestank von innen der Wagons, überwältigend war. Jeder wurde in den Wald von Rumbuli getrieben, und erschossen. Das Ende kam nachdem meine Eltern beinahe acht Jahre Verfolgung leiden mussten, ihre deutsche Staatsbürgerschaft entzogen bekamen, in die Armut gezwungen, und in jedem Wege verachtet und erniedrigt zu werden. Meine Eltern verbrachten jeden Tag in Angst, nicht zu wissen was der nächste Tag bringen würde. Meine Eltern waren ehrliche, anständige, und warmherzige Menschen, die keinem einen Schaden zufügen wollten. Meine Schwester und ich konnten den Tod meiner Eltern nicht betrauern, weil wir nicht wussten wie es unseren Eltern ergangen war. Eine Ungewissheit von vier Jahren. Aber wir hofften, dass meine Eltern noch am Leben waren. Die erste officielle Nachricht über das Schicksal meiner Eltern kam von dem Roten Kreuz wie ich mit der Britischen Armee in Berlin stationiert war (1946/48). Die Massengruben im Wald von Rumbuli machte keine Schlagzeilen in der ganzen Welt, eine Welt im Krieg. Ich muss zugeben, dass die Grausamkeiten im Wald von Rumbuli, in den vielen Länder in Europa keine Bedeutung hatte. Aber ich möchte das Folgende berichten. Soweit ich es weiss, was im Wald von Rumbuli geschah wurde in keiner Zeitung oder anderen Medien erwähnt. Ich bin jetzt in meinem 92. Jahrgang, und ich bin in der Hoffnung, dass soviele Menschen wie möglich in der Welt erfahren werden was im Wald von Rumbuli geschah. Wenn nur zu wissen was die armen Menschen erleiden mussten. Da waren nicht tausende von Menschen die Blumen auf die Gräber legten, oder Kerzen angezündet haben. Es gab keine Proteste. Keine Hornsignale oder Kanonenfeuer. Im Ganzen hatten die Deutschen es fertig gebracht sechs Millionen Juden zu ermorden in sechs Jahren, ein Drittel von der jüdischen Weltbevölkerung. Ein und ein Halb Millionen von den Ermordeten waren Kinder. Zehn Millionen Deutsche waren gehörten der Nazipartei an, und viele mehr Millionen von Deutschen hatten Sympathie mit dem Regime. Sie waren alle direkt oder indirekt verantwortlich für die Massenmorde von Juden. Die Deutschen die vor, und in der Mitte des Zweiten Weltkrieges lebten, hätten sich schämen sollen. Das deutsche Volk, welches Beethoven und Schiller der Welt gab, sollten Alarmglocken gehört haben, und nicht einem Verrückten und einen Sadist nachzurennen. Am Ende waren die meisten Deutschen froh die Juden los zu werden, und dabei das schrecklichste Verbrechen in der Geschichte der Menschlichkeit zu begehen. Meine Eltern liegen in einem Massengrab, und nicht einmal erinnert bei denen deren Hilfe meine Eltern brauchten. Meine Eltern hatten keine Waffen mit denen sie sich verteidigen konnten, und sehr wenige Menschen waren bereit meinen Eltern zu helfen. Diese wenigen Menschen waren in grosser Gefahr. Die Mehrheiten von Menschen in der Welt standen da, und sahen zu wie wir zu leiden hatten. Es gibt viele Plätze in Europa wo Juden von den Deutschen geschlachtet wurden, aber man hört oder sieht in keinem Bericht davon. Juden haben nie jemand enthaupt, oder sind mit Flugzeugen voller Menschen in Wolkenkratzer geflogen, oder sind mit einem Lastwagen in Gruppen von Leuten gefahren. Michael Portillo, der im Fernsehen ein Program leitet, "Railway Journeys in Europe", besuchte die Stadt Riga. Eine schöne Stadt, mit vielen Kaffeehäusern, und lustig aussehenden Menschen. Da war nie eine Rede vom Wald in Rumbuli und deren Massengräber. Ist da jemand der in Riga wohnt der etwas von den Gräbern weiss? Ich möchte mich entschuldigen wenn ich bestimmt viele Fehler gemacht haben muss. Mein Wörterbuch war eine große Hilfe.